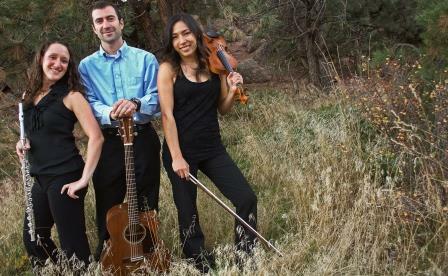 Con Brio Trio is a dynamic group of young performers comprised of a flute, violin, and guitar. With over 17 years of ensemble and solo experience both nationally and abroad, these musicians will delight crowds of all ages at a diverse range of events. Con Brio is available as a flute, violin, guitar trio, as well as a flute/guitar duo, and can provide any of these instrumentations to cater to your special occasion. Our repertoire is extremely diverse and includes classical, Celtic, jazz, pop, and even Blues to add variety for your event. We also arrange our own music, and are happy to accommodate any special requests you may have free of charge! Very professional musicians, our tenant holiday party was such a success, and largely due to the beautiful music being played. I would highly recommend them! Thanks so much for your kind words, Beverly! We truly enjoyed playing for you and your wonderful colleagues! Con Brio Trio was professional and sounded amazing. They brought all mecessary equipment and kept the party going. They also offered many songs to choose from in their repertoire, so everyone loved them. Thanks again for helping make our wedding so special! Thanks so much, Jessica! We loved playing for you and your loved ones. Congratulations again on a beautiful wedding! We cannot say enough good things about our experience with Bria and Con Brio Trio. 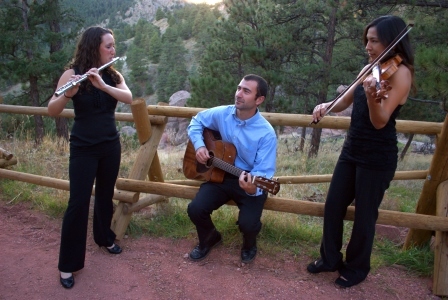 They traveled to Spruce Mountain Ranch in Larkspur to play for our daughters wedding ceremony. Outstanding! We had many comments about their performance and the lovely touch having them brought to our day. They were very accommodating and super easy to work with...would highly recommend this faboulous group of musicians. Con Brio Trio was an absolutely wonderful addition to our wedding. Bria was very responsive to my emails and the whole process was very smooth. The band learned two new songs for our wedding, including one which some friends sang along with. I couldn't have asked for more, it was perfect! Thanks Con Brio Trio! We hired the Con Brio Trio to play for 2 hours at our wedding. They played before the ceremony as guests arrived, during the ceremony, and for the entire cocktail hour. I literally cannot compliment them enough! They were by far our favorite vendor. From my first communications with Bria, I knew they would not disappoint, and I was right.. They are all SO talented and were able to customize three songs for me, which really meant so much to me and my family. Brad, the guitarest, was able to compose them and they truly sounded perfect. They are all extremely professional and polite, and their music is absolutely exquisite. I would without a doubt, HIGHLY recommend them to anyone, for any type of event! I am so THRILLED that I will be able to see and hear them play at my sister's wedding later this year. Working with them and communicating was a breeze. Bria is such a sweet person and very polite and prompt with responding to all of my emails. I also think the price I paid was extremely reasonable. They were worth every penny and thensome!! If you are considering hiring them, DO IT! I promise, you will not be disappointed at all!! It was a sheer pleasure! We had a pleasure of welcoming Con Brio Trio at our Musical Salon last Friday. The concert was very well recieved, and our residents complemented musicians a lot, appreciating the selection and variety of musical pieces, as well as their professionalism and very pleasent personalities. One of Con Brio Trio's many talents is the ability to fit in perfectly with any event - we can serve as the perfect mood-setting background music, or we can provide more of a spotlight/showcase performance. We provide our own sound equipment and music stands. The only thing we ever require from the venue are chairs, a power source, and extension cable if applicable. We easily work directly with wedding and event coordinators to ensure that the timing and mood of music is a perfect fit for the client's needs. Special song requests are never an issue for us as Brad, our guitarist, is extremely skilled with composing and arranging for our group! When planning your event, our manager, Bria, is available by phone or email at any time of the day. We are very well organized, and quick to respond to any requests you may have. We realize that no two events are ever the same, and take great joy in customizing each event to ensure all of our clients' needs and requests are met in a timely fashion. Con Brio is a dynamic, talented group of performers comprised of a flutist, violinist, and guitarist. With over 17 years of ensemble and solo experience both nationally and abroad, these musicians delight crowds of all ages at a diverse range of events. Their specialty is adding a classical twist to hits from across a variety of genres and generations - they can write a custom arrangement of any song you want to hear! Con Brio performs at weddings, receptions, cocktail hours, corporate functions, conferences, and parties, and can serve as the perfect entertainment to any gathering - large or small. 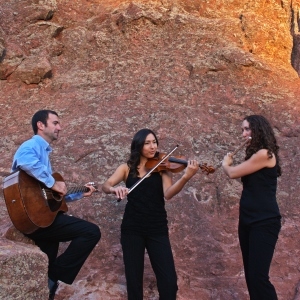 Their repertoire is extremely diverse and includes classical, Celtic, jazz, pop, and even Blues. Con Brio is available as a trio (flute, violin, guitar), as well as a duo (flute and guitar), and can provide any of these instrumentations to cater to your special occasion. Philadelphia native Bria Schecker began her flute studies at age 7 with renowned Russian flautist, Ilya Ovrutsky. From solo performances at the US Embassy in Paris, to an orchestral residency with West Chester University in Sicily, to woodwind quintets and symphony orchestras in the United States, Bria has enjoyed playing in diverse settings all over the world. She completed her bachelors degree at Boston University, where she played an active role in the all-campus music program, serving as principal flute for the orchestra. In Boston, Bria served on the Board of Directors and performed on several principal parts for the Cambridge Symphony Orchestra prior to relocating to Boulder. Adrienne Short is a freelance violinist in the Denver area. She currently performs as Assistant Concert master of the Arapahoe Philharmonic. She is also a member of the Fort Collins Symphony, and serves as a substitute violinist with the Boulder Philharmonic and the Cheyenne Sympnony. 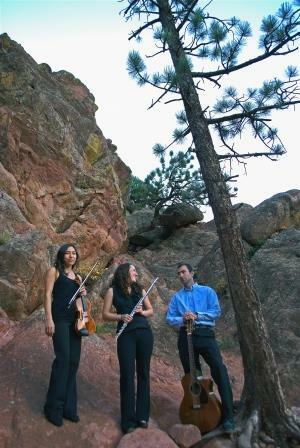 Adrienne graduated from Denver University's Lamont School of Music with a degree in Violin Performance and French. She also studied in France, where she gradutated from the French Conservatoire Henrie Duparc. 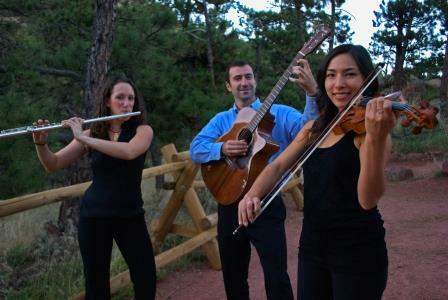 Adrienne currently works as a private teacher in and around Denver, as well as a recording artist and orchestral player. Brad Garone is a Boston-born guitarist, composer, and arranger. He is a private music teacher by day and an active gigging musician at night. After years of self-taught practice, Brad attended the prestigious Sound Recording Technology program at UMass Lowell. At UMass, Brad studied under the renowned Jazz Guitarist, Jon Wheatley (UMass Lowell, Berklee School of Music). Brad has served as lead guitarist with several distinguished bands and artists including Mondo Gecko and the Ross Livermore Band, and has toured the country with his music. Most recently, Brad served as the lead guitarist for the Boston-based funk/soul cover band, Sugarfoot, before moving to Boulder. We provide our own sound equipment when necessary. We require an armless chair for each performer, and access to a power outlet.